US, 1956, 108 minutes, Black and white. Joan Crawford, Cliff Robertson, Vera Miles, Lorne Greene, Shepperd Strudwick, Ruth Donnelly. 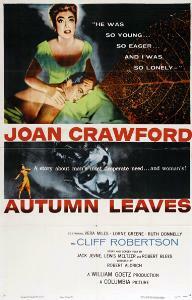 Autumn Leaves is a typical Joan Crawford soap opera of the '50s. It is highly enjoyable and very well done in its style. During the '50s Joan Crawford moved into a series of melodramatic thrillers as Sudden Fear, Female on the Beach, Queen Bee and this film. She suffers dramatically. Cliff Robertson is quite engaging as her co-star. He was at the beginning of a successful screen career with this film and Picnic. He won an Oscar for Charley in 1968. There are interesting performances by Lorne Greene, Vera Miles and, particularly, Ruth Donnelly as Joan's hard-bitten landlady friend. The theme song sung by Nat 'King' Cole has become a popular classic in the succeeding years. Direction is by tough director Robert Aldridge. Aldridge had worked with a number of directors including Chaplin and then moved into his own career with some small-budget films but had great success with Apache, Vera Cruz, The Big Knife at this time. Very much a man's director in such films as The Dirty Dozen and his films with Lee Marvin and Burt Reynolds, he is also noted as a woman's director with such films as this one and his other Joan Crawford film, Whatever Happened to Baby Jane, with Bette Davis. Joan Crawford was also to appear in Hush, Hush, Sweet Charlotte but became ill. Other films by Aldrich with the feminine emphasis include The Legend of Lila Clare, The Killing of Sister George. If soap operas are to be made, this is how they should be done. 1. The impact of the film as entertaining soap opera? Classy 'woman's film'? The melodrama of the '50s? How much insight into human nature? 2. Production values, the film as a Joan Crawford vehicle, the highlighting of its star in style, photography, costumes? The supporting cast? Black and white photography? The theme song and its use? The background of Los Angeles and its atmosphere? 3. The focus of the title, its tone? The irony of Millie’s middle age and life passing? An autumn romance? The bitterness of autumn? Autumn as bittersweet before winter? How well did the film use its title tone? 4. Joan Crawford as Millie? How credible was she as the recluse type? Her typing, her living by herself, her friendship with Liz? The typing and the tickets for the concert? Her going alone? The friendship with the Army man and his manuscript? The importance of her memories and the dominance of her father? Her being embittered, shy? How persuasive was Joan Crawford in making Millie believable? 5. Liz and her friendship, the taken-for-granted friendship, establishing the atmosphere of Millie's house, style, way of life? Her helps, discussion, involvement in Millie's plight? An engaging middle-aged tough American woman? 6. Millie and the encounter with Burt at the restaurant, her reserve and not wanting him to sit at the table, his genial talking to her, the communication, his drawing her out of herself? His escorting her home, plans for the date, the swim and her shyness about the swimming costume, her enjoyment of the swimming and his support? Their discussions, laughter, the	outing at the film with the laughing at the Mr. Magoo cartoon? His telling his life story, his proposing and her accepting? 7. How credible the build-up to the marriage, her marrying Burt? The background of his going to work, buying presents? Her apprehension but her hopes? Their love for one another? 8. Millie's becoming alert to the inconsistencies in Burt's story, especially about his war experience? The immediate arrival of Virginia? The first impressions of Virginia and her style? Her imposing on Millie, the story of the marriage, the explanations of Burt's childhood, his relationship with his father? Millie's visit to Burt's father and the discussions, her realising the relationship between Virginia and Burt's father? Her going to the store and discovering the truth about his work? Her trying to cope with this information? 9. Her confronting Burt? Her wanting him to visit his father? Her saving him? Her antagonism towards Virginia? His reaction about the marriage, his disregarding Virginia, the shop, the presents? His becoming wilder in his outbursts? The fight and injury to Millie's hand? The clash with his father and Virginia? His suspicions about Millie and his creating the scene in the street? 10. The growing evidence of the illness, its manifestations, moodiness and violence? The visits to the doctor? The background of psychiatry of the '50s? Millie's not wanting to commit Burt for treatment? Her growing exasperation and inability to cope, her grief in committing Burt? 11. The effect on Millie and his not communicating with her? The suddenness of his being released from the institution? Her going to meet him, her long speech ? not allowing him to speak? His acceptance of her? The possibility of his cure, growing in love, a successful marriage? 12. The insight into the middle-aged spinster, her being made to face the realities of life, her ability and inability to cope? Her capacity for love? Building on this? Burt and the mixed up man, violent outbursts, treatment? Health? The optimism of the ending and their coming together? An enjoyable piece of melodramatic Americana?